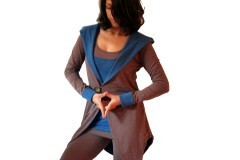 Express the many faces of your inner Shakti with this stylish multifunctional tunic. Wear it three ways: hooded, shawl, off-the-shoulder – or use your imagination! Contrasting color lining of the hood and ruched sides.